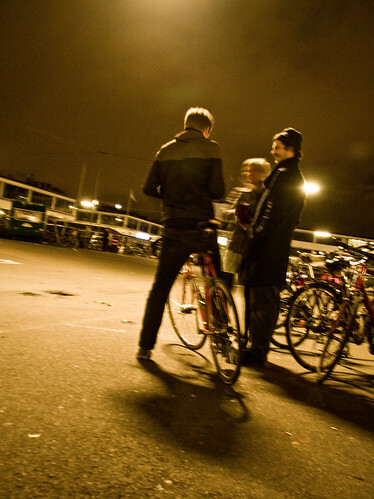 The bicycle has an integral role in Copenhagen nightlife. Only 40% of Copenhageners own cars so when the surburbanites motor on home after work, we get visions of what our city looks like with hardly any cars. 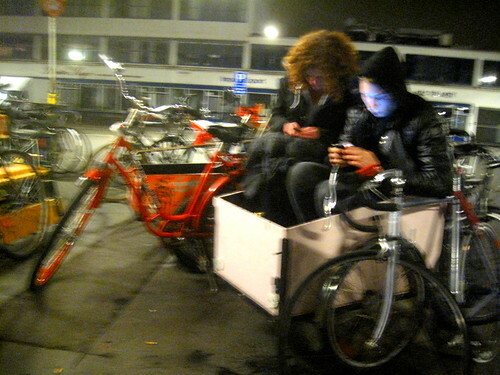 It's especially on weekend nights that the bicycles really rule this town. Like here in the Meatpacking District - Kødbyen. 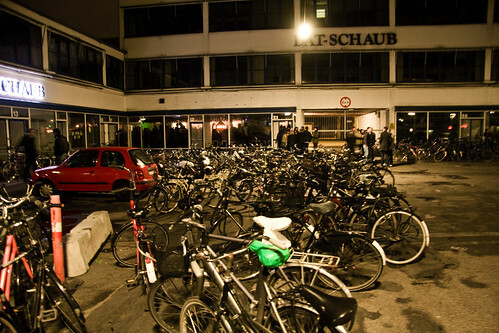 This is the bicycle parking outside just one of the many bars. All the other bars - in the meatpacking district and the rest of the city feature the same view. 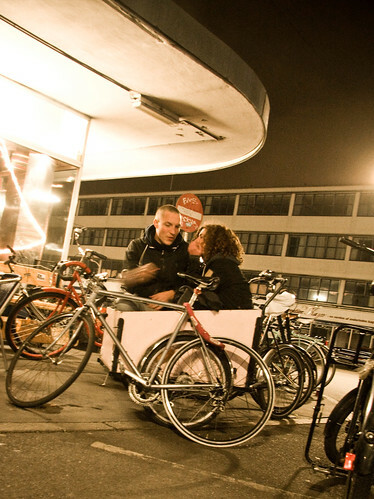 Outside Mesteren og Lærlingen there was a cargo bike parked and it was a cosy place to hang out for a chat. Or to send text messages, planning the rest of the night's activities, hooking up with friends, or what have you. 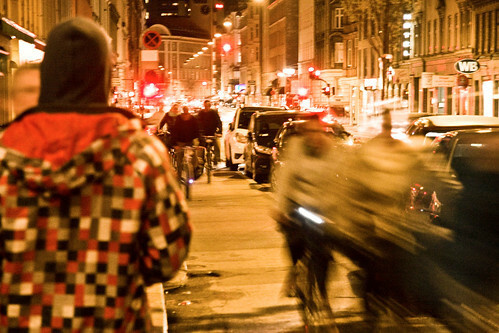 All throughout the city, bicycles are in motion all night long. 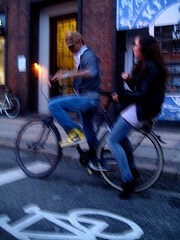 As are friends of mine, frolicking outside another bar. It's how you get to where you're going and it's how you get home in the wee hours. And yes, red heels look best with a red bicycle. Duh. 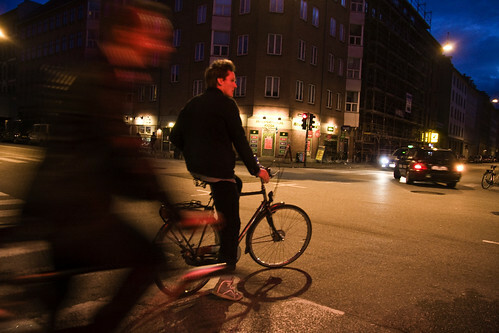 The nightlife in Copenhagen goes all night. Preferably well into the morning. When the birds start singing and the Nordic sun starts to rise, you know it's been a good night out. Nothing beat biking at night. I really miss the night life of a big city - the lights, the activity, the sense of nocturnal adventure. Flagstaff is a little mountain town so night biking is more surreal - the sound of quiet and stillness under a thick blanket of stars. A experience to be sure but prefer the hustle and bustle of the city. The texting shot is awesome, but I wanna meet your friend who's breakdancing on the sidewalk! That's an insanely cool shot of the guy frolicking outside the bar. Love it. 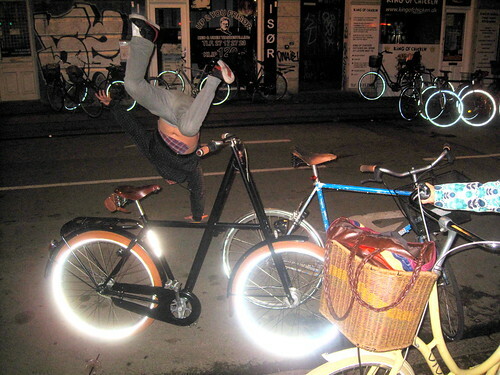 it was an awesome bicycle that had a light in the gear. so cool i like it.